Tucked way into narrow Aurlandfjord, a tributary of the 127-mile long Songnefjord, is a tiny settlement which receives nearly half a million visitors each year. Flam is a neat, picturesque village featuring one main highlight beyond the beautiful fjord countryside that it lies in - the Flam Railway. Tour the clean and modern town and check out the quaint shops, restaurants, bars and boutique hotels than line the waterfront. 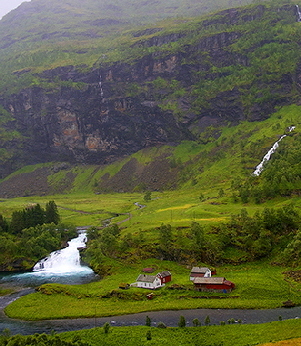 To visit Flam (www.visitflam.com) and enjoy it to its fullest, you must get a "ticket to ride" … on the railway . It is one of the steepest rail tracks in the world and also one of the most scenic with spectacular panoramas near each bend of the tracks. Nearly 80% of the twisting route is on a 55% gradient that encompasses 20 tunnels which spiral through the mountainous terrain. On the 12-plus mile journey rising to a height of 2,845 feet, you can see beautiful clear-water rivers with rapids that cut through deep ravines, waterfalls that cascade down the side of steep, snow -capped mountains and remote farms that sit at the edge of mountain slopes. Leaving Flam, you see the small, brown, wooden church, dating from 1667, nestling beautifully in the landscape. 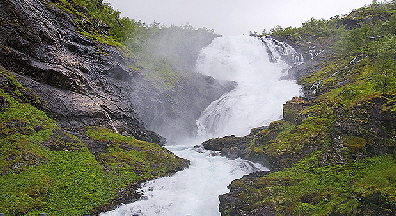 Vidmesnosi Mountain provides the backdrop for the Rjoandefossen waterfall, which cascades 460 feet down the steep mountainside. The modern mountain goat-farm at Kardal is a new and interesting feature. The 150 goats have been highly popular with photographers, as is the landscape of green pastures beside the river, slopes covered in lovely birch woods and snow-clad peaks in the background. As the train enters the railway's longest tunnel (4,300 feet), you will catch an impressive glimpse of the track running on four different levels of the mountain side. 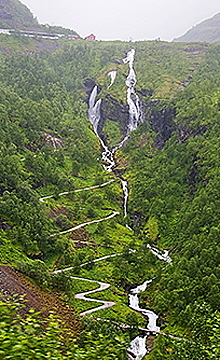 When the train stops at Kjosfossen near Mrydal, passengers can get off for a few minutes on the platform to see a beautiful waterfall and the rushing river of water dissolves into foam with a thunderous roar as it hits the mountain on its way down. Remnants of the original power plant still remain here. Since many of the passengers get off to take photos and the platform is not huge, we recommend waiting until the train returns back the same way where it will stop again. Way less people will get off on the way back so it is easier to get the photo you want. There are beautiful waterfalls, winding streams, steep mountains and interesting looking farm buildings all along the canyon that the train follows. If you are shooting photos though, you have to be ready and quick! Some fantastic sights are right after the train exits from one of the many tunnels along the route, while others may be just before you enter a mountain tunnel. Keep cameras ready for Reinungvatnet, a truly beautiful mountain lake near the rest stop at Vatnahalsen Hotel. This popular mountain hotel is open all year and offers hiking, mountain biking, or winter skiing. The hotel is very eclectic and is kept in very good condition. It certainly fits in its environment! When we disembarked the train, we walked a short distance to the hotel, where our group was served waffles, hot chocolate and tea, certainly fitting for the rainy weather. Interestingly, instead of whipped cream, the waffles were served with sour cream that looked like whipped cream, and it was not very popular among our group. To get the complete history of Flam and the railway you must visit the interesting railway museum, and we did just that when we returned back to town. It was extremely interesting to see the old tools, rail repair car, the engineering plans and old photos of the hardy lifestyle that was necessary to make this railway reality. 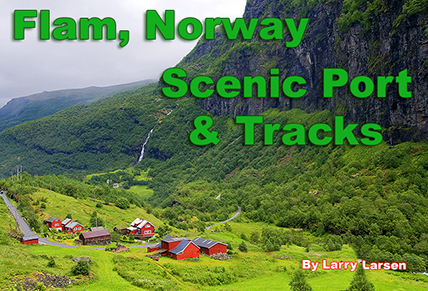 The Flam train is a ride well worth your time. All aboard!